As the flu season quickly approaches, it is important for you to protect yourself and your loved ones. Aside from causing debilitating and sometimes even deadly symptoms, one of the most concerning aspects of the influenza virus is how quickly it can spread. Healthy adults can pass along the virus before symptoms arise and can remain contagious up to five days after falling ill – meaning it can spread like wildfire in the workplace. Contracting the flu not only puts you and your loved ones out of work or school for several days, but can also have serious consequences for high risk individuals like pregnant women, the elderly and those suffering from respiratory illnesses or conditions that compromise the immune system. Keeping this in mind, it’s important to understand these flu myth-busters so you can better protect yourself, your co-workers and your family. FACT: The flu does not usually produce gastrointestinal symptoms. Instead, you’re more likely to experience a high fever that lasts for several days, a cough, sore throat, headaches, body aches and general fatigue. According the Centers for Disease Control (CDC), children are more likely to experience vomiting and diarrhea from the flu than adults. If you’re experiencing some or all of these symptoms, stay home from work and consider consulting your doctor. MYTH: With luck, the flu will get better in a couple of days. FACT: The flu generally lasts five to seven days, but can last longer for some. Even after symptoms have subsided, you may continue feeling fatigued for a few days. 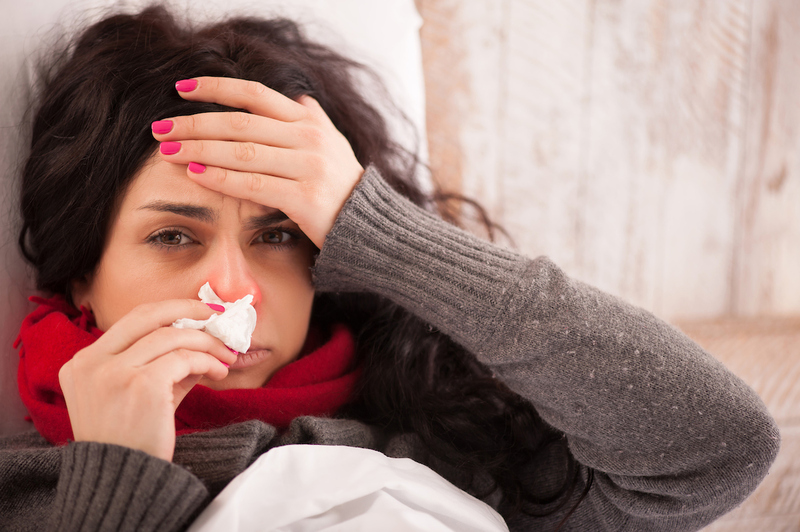 The best way to get well is by staying home to rest, drink plenty of fluids and take fever-reducing medications. MYTH: Antibiotics will help you fight the flu. FACT: The flu is caused by a virus, meaning that antibiotics are ineffective in flu treatment. A doctor may prescribe antiviral medications, but in order to be effective, they must be taken within 2 days of getting sick. While taking antiviral medication isn’t a cure-all, they can decrease symptom intensity reduce the flu’s duration by a couple of days. While many can forego this treatment, those who are at high risk for complications should seek treatment with their doctor. MYTH: If you get the flu, you can tough it out and go to work or school. FACT: The flu is highly contagious. According to the CDC, it can even be spread to those standing up to six feet away through coughing, sneezing and talking. If you suspect you have the flu, stay home from work and limit contact with others to keep from infecting them. MYTH: Only adults ages 65 and older or those with respiratory problems such as asthma or immune disorders need a flu shot. FACT: Everyone 6 months of age and older should receive a flu vaccine to help prevent the illness, reduce doctor and hospital visits, and lessen missed time at work. MYTH: I’ve heard of people getting a flu shot and then getting the flu. FACT: Flu vaccines don’t contain living influenza virus and can’t cause the flu. According to the CDC, the most common flu shot side effects are tenderness or swelling at the injection site. Those who claim to experience flu-like symptoms after receiving the shot are most likely experiencing symptoms of the common cold, which the vaccine doesn’t protect against. Ultimately, the best way to protect against the flu is to be vaccinated every flu season. Cover your nose and mouth with a tissue when you cough or sneeze, and then throw the tissue in the trash after you use it. Be sure to keep a box of tissues nearby in your home and office. Wash your hands often with soap and water, especially after you cough or sneeze. Keeping an alcohol-based hand cleanser on your desk at work can be effective. Do not visit the hospital if you are sick or have had any ill symptoms within the past three days, including nausea, vomiting, diarrhea, fever, uncontrolled cough or rash. Discover where you can get a flu shot. Find a Primary Care physician or an Urgent Care Center near you.